If its not fixed in under 48 hours, I think I’m going to have to commit suicide. Hope merge has a good tech team. That seems borderline excessive, but we’re working on it. I assume everyone is being tongue-in-cheek. Poker Copilot 3.15 is now available to download. 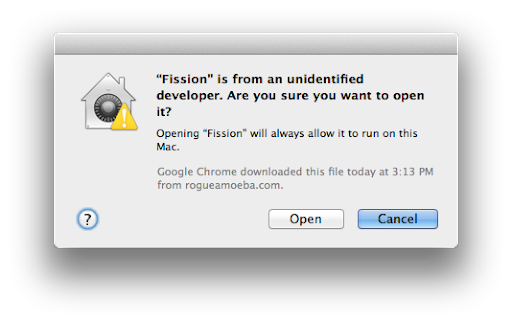 Today Apple is releasing OS X 10.8, also known as OS X Mountain Lion. This introduces a new technology called Gatekeeper. By default it prevents many applications for being installed, unless the applications have met some standards for ensuring they can’t easily be hacked to contain malicious code. Today’s update meets the requirements for Mountain Lion and Gatekeeper. 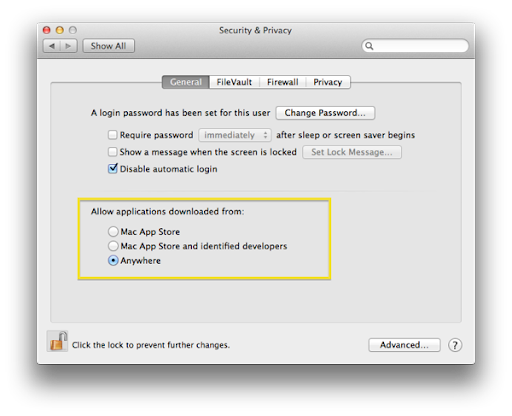 Changes for OS X Mountain Lion’s (OS X 10.8) Gatekeeper feature. A friend of mine started using Poker Copilot recently. At first she found the statistics mystifying, so here’s the advice I’d give her – and others. Agree with me? Disagree? Add you opinion in the comments. 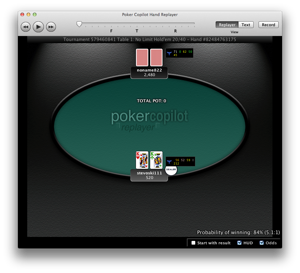 The first thing you should do with Poker Copilot is evaluate your own playing style using these statistics. This measures how often you voluntarily invested money into a hand. Paying the big blind, the small blind, or the ante is not considered voluntary. Therefore this percentage indicates how often you called, bet, or raised. The lower this value, the tighter your hand selection is. The higher, the looser. What is a good VPIP range? Simple answer: between 15% and 20%. This assumes you want to play tightly, you are playing micro-stakes, and you are playing on full ring tables. Now the more complicated answer: it depends a lot. If you are still learning to play good poker, then you should be very selective in which hands you play, so your VPIP might acceptably be a tad lower than 15%. The less people on the table, the more hands you can play. If you are on a table full of ultratight players, you can also loosen up. An experienced player who understands the subtleties of the game can get away with a VPIP between 20% and 27%. The PFR statistic indicates how often you have raised before the flop is seen. A high value is an indicator of an aggressive player. A low value indicates a passive player. Good players are aggressive players. Your PFR has a possible range of 0% to the value of your VPIP. e.g. if your VPIP is 20%, then your PFR can’t be higher than 20%. Ideally it should be a little lower than your VPIP, but not much lower. Poor players and beginners tend to timidly fold or call preflop. Good players tend to fold or raise preflop, especially if no other players have yet raised. What is a good PFR range? Between 2% and 3% lower than VPIP. If your VPIP is 15%, PFR should be about 12%. These two numbers in combination, indicate that you are only playing quality hole cards, and you are predominantly raising with them pre-flop. In other words, you are playing how most poker books and poker forums say you should play. Agg indicates how aggressively you play post-flop. The higher this number, the more aggressively you are playing. This must be interpreted in combination with VPIP. Players who see very few flops will naturally tend to have a higher aggression percentage because they are only playing top-quality hole cards. What is a good Agg range? 50% to 60% is ideal , assuming that you have a VPIP of 15% to 20%. Much higher, and you are probably overplaying speculative hands and bad hands. Leave the bluffing for the movies and for live play. Much lower and you are not playing your good hands strongly post-flop. o much detail when small. If you know of some good, free, playing card graphics I can use for the replayer please do let me know. Poker Copilot 3.14 is now available to download. Added Felt Stars support (Merge Network client). Added Betsafe support (Ongame Network client). Fix: Tournament bankroll chart was crashing if a tournament size filter was in use. 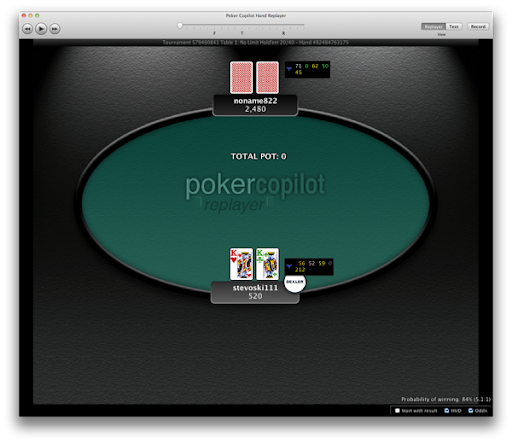 Fix: After running Poker Copilot continuously for 24 hours, some tournament hands would stop importing correctly. PokerStars playing audits are currently not always importable by Poker Copilot. This is due to some ambiguous date formats PokerStars has started using.